Dirtbusters offer a professional and reliable monitored service for your commercial cleaning needs. With twenty years experience in cleaning commercial buildings, we can offer a solution tailored to your requirements. With a comprehensive range of equipment we can take on any commercial cleaning job, whether it is cladding, glass or internal building cleans. We follow strict procedures and health and safety guidelines. In addition, our operatives are CRB checked and follow COSHH guidelines when using chemicals. We keep to the most environmentally friendly methods of cleaning that we can for the required cleaning process. Click here to contact us for a free, no obligation quotation. 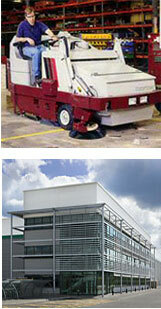 Dirtbusters offer site cleans for new build developments or refurbished sites. It is important to present new build or refurbishment to a client in a good state. However good your job is, if the site is left dirty or building debris and dust is left for the client, the end result will be much less satisfactory. Let Dirtbusters clean the site to a high standard and we will make sure your site looks as good as it can after you have finished with the building work. Contact us for more information.